Final Fantasy 15 is a bit of an enigma. It's tied to the previous games in the series through various callbacks, motifs, and symbols, but its narrative and gameplay structure couldn't be more different. It drops turn-based combat for real-time action, and its story follows a group of four friends through a world that looks a lot like our own except it has way more rideable ostrich monsters. 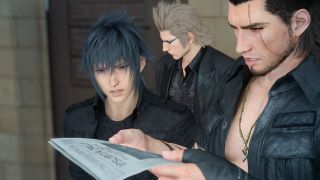 It's a strange, wonderful game to play, but the way it works is often so different from not just the rest of the Final Fantasy series, but RPGs and open-world games as a whole, that you'll often be wondering what the hell is going on. Like Ignis with his culinary delights, I've whipped up a few tips that should help set you on the path through Lucis and the world beyond. Watch Kingsglaive. And maybe Brotherhood, too. Yeah. It's a bummer that much of Final Fantasy 15's story is locked away behind that awful 'trans-media' word. It's an even bigger bummer that Kingsglaive isn't packed in with every single copy of Final Fantasy 15. But if you want to have even a glimmer of hope of making sense of the game's story, you gotta watch the movie first. Luckily, Kingsglaive is pretty entertaining; a flashy, action-packed introduction to the world of Eos and the political turmoil currently ripping it apart. There are bits in the game that try to explain some of this lore, but any story or characterization that isn't about Noctis and his buds is handled really clumsily. Kingsglaive, then, is your best intro to the game's character motivations and behind-the-scenes machinations. It's included with the Limited Edition, but you can also buy it separately on Blu-ray from your retailer of choice (prices have gone as low as $10), or rent it from various digital platforms. Then there's Brotherhood, a series of five 10-minute-long anime episodes focusing on each of the individual bros, their backstory, and their relationship with Noctis and the kingdom as a whole. It's pretty good too, telling small, personal tales about really interesting characters. It's not as necessary as Kingsglaive, but it delves more into the relationship between the King and his son Noctis, it's under an hour long, and it's free to watch on YouTube (a physical copy is included with the Steel Book edition of Kingsglaive or the $270 ultimate edition of the game), so the barrier to watching it is much lower. After a brief cutscene, Final Fantasy 15 sets you loose into its open world, letting you explore, take on monster hunts, and basically get into trouble at your own pace. The allure of this world is very, very strong, but it's perhaps best to keep your wanderlust in check until you hit chapter three. Because once you do, you'll gain access to one of the most useful modes of transportation in the game: chocobos. While the Regalia is really good for getting across long distances quickly, you're essentially locked to the Lucian highways, and you'll still have to hoof lengthy distances to your quest destinations. Once you unlock the ability to rent chocobos (which you do by completing the behemoth hunt sidequest at Wiz' Chocobo Ranch), you can pay a pittance to rent them for however many days you like at the various outposts you come across. Once you can ride these oversized birds around, cleaning up quests and exploring becomes much more manageable. Getting the hang of warping Noctis around the field is a bit tricky, but learning how to do it properly is vital to getting the most out of combat. Locking on and pressing the warp button will cause you to launch into a Warp Strike, and the further away from the enemy you are, the more damage you'll do. Pressing the warp button without locking on will launch you in the direction you're moving in, and holding the warp button while looking at specific bits of scenery will cause you to launch and stick to it - handy for getting out of combat quickly to recharge HP and MP. Speaking of HP and MP, they both work quite a bit differently here than in other Final Fantasy games. You have two separate HP meters - your normal one, and a shadow meter underneath. It works a lot like a fighting game, actually. Some attacks will deplete your normal health meter, but can be restored with potions, while other attacks - or attacks that hit you once your HP is gone - will cut into your shadow meter, effectively cutting into your max health total. You can only restore your max HP levels by drinking Elixirs. MP is what you'll use to Warp Strike enemies, as well as dodge incoming enemy attacks. Once that hits zero, you'll enter stasis, and attempting another magical ability will cause you to lose stamina and stand in place for a few minutes. You can heal stasis with Ethers. You can revive health-deprived party members with restoratives or by running over to them and tapping the revive button prompt. Once they're down, though, the only way to bring them back is with a phoenix down. Once all four dudes are down, it's game over - though as long as you don't punch too high above your weight and have enough items, game over is generally rare. Always be looking for opportunities to perform Link Strikes with your buddies - activated by hitting an enemy in the rear when one of your teammates is nearby - which will cause even more damage. Also, don't be afraid to use techniques constantly - the Tech Gauge will fill throughout battle, and each party member has a slate of unique skills they can use to help turn the tide. Just remember - it's a real-time action-RPG, so always stay moving, keep aware of your surroundings, and remember to block and counter. Wait mode is there if you need additional assistance, allowing you to pause time when you stop moving, analyze enemies, and plan your next attacks. You can switch at any time, and there's no penalty for choosing to turn it on or off at your discretion. As you fight and explore, you'll earn both EXP and AP. EXP is what you earn to level up each character, making them stronger with each bump up in number. AP is what you'll spend on the Ascension grid, Final Fantasy 15's web of unlockable abilities and skills. These are a little harder to come by in comparison, only earned when you complete specific tasks or in chunks when you level up, but there's an easy way to help earn you a mess of AP without really trying. When you defeat enemies with a Warp Strike or a Link Strike, you'll gain one AP. This doesn't seem like a lot, but keep in mind - once you outlevel weaker enemies, you can often defeat them with a single hit. Now, trash mobs you'd just ignore are suddenly easy ways to farm for additional AP. Simply lock on, warp into an enemy until it's dead, and move onto the next. There's a fast travel system in place to help get you avoid long travel times if you want to avoid them, but there's no getting around it - you're going to spend a lot of time driving or riding chocobos to your destinations. Why not turn that downtime into profit by snagging the Roadrunning and Chocobump abilities on the Ascension grid? At 32 AP apiece, they're pretty pricey in the early going, but they're worth every point as they give you additional AP for every minute or so you spend driving or riding on a chocobo. They'll more than pay themselves off by the game's end and, when coupled with the combat tips above, will help you pay for those really pricey upgrades on the grid later on in the game. Don't stress so much about the other AP or EXP upgrades in the exploration tier - they're helpful to have, but they're not nearly as necessary. Money works a little differently in Final Fantasy 15 than it does in other games in the series. Rather than earning gil directly from enemy drops, you'll instead get various items - 'treasures' like animal pieces, coins, and other various bits and bobs - which you can use to sell for cash. You'll also earn money from completing various quests or hunts, the latter of which is a far more reliable way to fatten your wallet. Here's the thing - while you should probably sell off most of the items you come across, you don't want to just empty your inventory at every opportunity. Generally, many of these items will allow you to tweak the elemental spells you can craft, often adding various boosts like dualcast (which casts two spells in one), inflicting additional status ailments, or even granting you extra experience points, and they're real handy in a pinch. There are also a few specific items that you can to hand over to Cid, who can upgrade a handful of weapons for you at Hammerhead Station. The specific items vary depending on the weapon or how far along the upgrade chain it is, but these weapons are well worth taking to their strongest forms - and if you sell all your treasures, upgrading them is a much more laborious process. You'll often find several of each simply by playing through the game, but when in doubt, make sure you hang on to at least one of everything, just in case. As you set into Final Fantasy 15's rhythms, you'll find yourself adhering to a strict schedule. For the most part (at least in the early going), daytime is for running around and getting stuff done, and nighttime is for avoiding deadly daemons which make for treacherous driving conditions, and going to bed. Sleeping doesn't just pass time - it banks your earned experience points, leveling up your team and making them stronger. There are two ways to hit the sack. The cheapest way is to find one of several camping spots around Lucis and pitch a tent. When you do this, Ignis will cook dinner for everyone, and the food will provide your team with a variety of stat boosts for the next day. Eating in Final Fantasy 15 is important, often meaning the difference between life and death against stronger enemies. The other, more expensive way to rest is to find a hotel or caravan at various outposts and cities. You won't get any food (no continental breakfast in Lucian hotels, I guess), but you will get a bonus to your experience points earned - the most expensive hotel is in Altissia later in the game, and will give you three times the amount of experience earned. So if you have a bunch of EXP and you want to make the most of it (and you have the cash to splurge), pay for the room and reap the rewards. Each one of Final Fantasy 15's various stores have a similar selection of items - your Potions, Elixirs, what have you - as well as a handful of unique treasures and key items. These can range from custom decals you can apply to your car, new fishing gear, and even additional soundtrack CDs to listen to on the road. Each of these CDs acts as a greatest hits of Final Fantasy tunes, culling tracks from nearly every mainline release in the series. If you want to cruise down the road while listening to Blue Fields from Final Fantasy 8, seek out each shop and scour their wares. There are going to be times when you're out on the road and you suddenly realize you failed to pick up potions back at Lestallum. Don't worry about pulling over; you can open up the navigation menu and access a special shop mid-trip. It won't have as many options as your local market, but it's handy in a pinch when you need to stock up on phoenix downs at the last minute. There are also a handful of special items, like a portable music player that lets you play the game's various soundtracks while you're running around outside of the car. Don't forget it's there - the shop can be a lifesaver. Eventually, your journey will force you to leave Lucis behind and continue onward. It's here where Final Fantasy 15 becomes much more linear, almost grabbing you by the collar and dragging you toward the finish line. You may feel pressured to complete every single quest in Lucis before moving on. Don't be - you can come back whenever you like. All you need is access to a bed, and you can summon Umbra, a reliable pup who will let you travel back in time to mop up any quests you want to. Doing so is actually necessary, as a few quests require items from things that only happen after the supposed point of no return. Plus, even more quests, dungeons, and other special treats only open up once you actually finish the game, including the ability to fly in an airship.